Friday 26th September 2014 – 1.50pm – Claire Brown. A hotel in Wolverhampton has added a life-saving box to its list of guest amenities thanks to a generous donation by The Rotary Club. 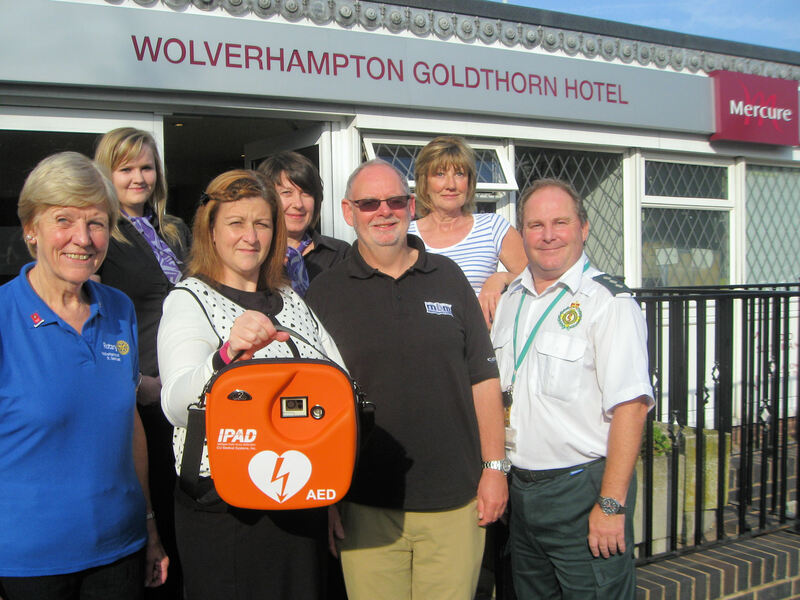 The Mercure Wolverhampton Goldthorn Hotel on the Penn Road recently took delivery of an Automated External Defibrillator; a device used to help restart the heart of someone in cardiac arrest. The piece of kit was donated by The Rotary Club of Wolverhampton and part-funded by a family fun day organised and hosted by the hotel and Rotary Club. West Midlands Ambulance Service recently went along to The Mercure Wolverhampton Goldthorn Hotel to train a total of 16 people, including hotel staff and Rotary members, in basic first aid and how to use the defibrillator. The defibrillator, which is located on the wall by the entrance of the hotel, is not only accessible to hotel staff but also to members of the public in an emergency. Andy Jeynes, the Trust’s Community Response Manager for Birmingham and the Black Country, said: “Its common sense for such a busy leisure facility to have a defibrillator and people trained in first aid as, with so many people using the hotel, it’s inevitable that someone will need vital first aid. They’re a very proactive team who are keen on looking after their visitors and staff alike.